Quick and easy meal that can be prepped the night before and kept in the fridge overnight and plugged in first thing in the morning. I made this on Halloween, and we actually went out trick-or-treating before eating, so it ended up being in the crockpot for about 12 hours. Was still totally awesome. Add all veggies to bottom of crockpot. Lay beef ontop (no stovetop browning neccessary). Sprinkle salt on meat. Pour canned tomatoes over beef. Sprinkle the rest of the seasonings over the tomatoes. Love crock-pot dinners! Definitely going to have to try. Thanks for sharing! 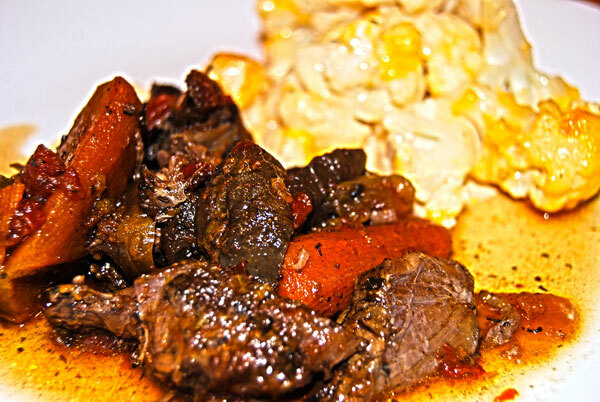 Hooray for the crockpot–excellent way to cook meat and I like all the veggies included in your pot roast! Thanks so much Mary! The crock pot saves me at least once a week.